Devin Williams’ 27 saves leads Tulsa to first-ever shutout over Kansas City in the 90th meeting all-time. 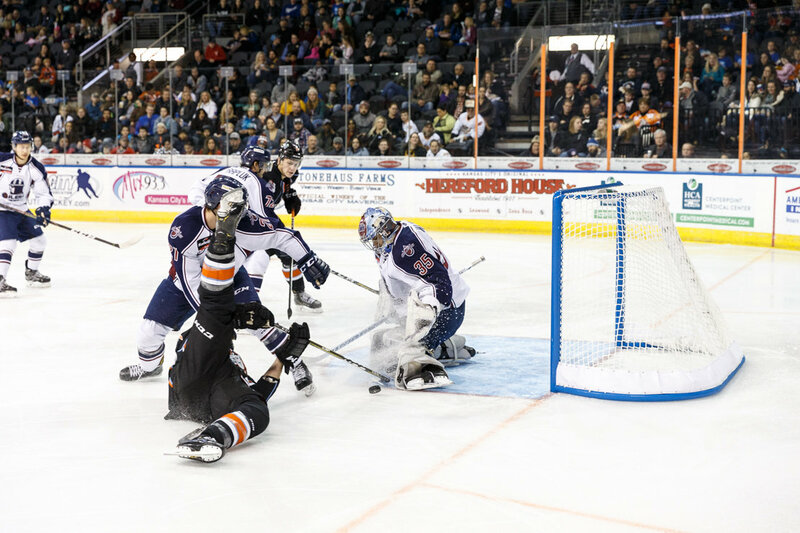 INDEPENDENCE, MO – The Tulsa Oilers (13-2-4) extended their winning streak to six games Friday with a 1-0 shutout win over the Kansas City Mavericks (11-5-1) at Silverstein Eye Centers Arena. It was Tulsa’s first-ever shutout win in the history of the rivalry, stretching 90 games. The Mavericks narrowly outshot the Oilers 15-14 in the opening frame, but Tulsa’s Steven Kaunisto scored the only goal of the period when he sent a wrist shot through a screen and into the net at 8:39. Tulsa carried a 1-0 lead into the locker room after 20 minutes. Tulsa held Kansas City to just three shots in the second period, as the Oilers maintained their 1-0 lead on the scoreboard. The Oilers generated nine shots in the frame, but were unsuccessful on two power plays. Devin Williams stopped all 27 shots, including nine in the third period, to earn his first shutout of the season and fifth of his pro career. The Mavericks loss was their first in eight games on home ice this season. The Oilers and Mavericks will face-off again Saturday at 7:05pm at Silverstein Eye Centers Arena. Catch all the action on the Sports Animal radio network in Tulsa, www.tulsaoilers.com or ECHL.TV, with pregame coverage starting at 6:45pm.